Marcus Perryman and I spent ten years working on these translations of a poet with whom I feel a close affinity. 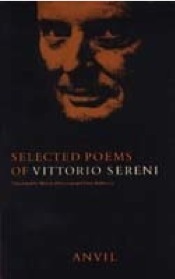 We would carry his books around with us to cafés and restaurants in Verona and sit over our versions for hours on end, trying out all sorts of variants and possibilities. It was a fascinating and frequently moving apprenticeship. We were also lucky enough to meet the poet a couple of times before he died in February 1983, and we received some invaluable guidance both on general strategies for translation and on specific points of detail. The book received half a dozen good reviews, including one in an Italian journal. 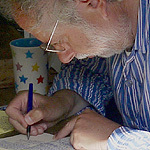 Charles Tomlinson described the translations in The Independent as 'versions that possess an uncanny accuracy, true to the fragmented, self-communing, smouldering and combustible humanity of Sereni's work' while Clive Wilmer in the TLS, though picking out various specific passages for criticism, noticed that 'Peter Robinson's own poetic manner - with its anxious tone of self-examination blurring into social concern - often provides an appropriate channel for Sereni's'.